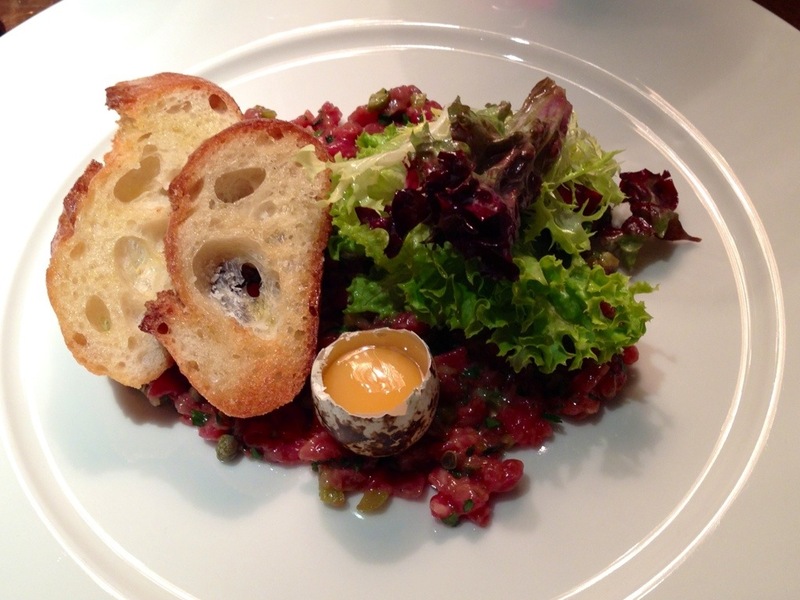 ‘Affordable French’ appears to be an emerging trend in London – both Brasserie Zedel and Balthazar have opened in recent months joining established restaurants like 10cases. They offer something a little more refined and unique than the chain alternatives – Cote Brasserie, Cafe Rouge, Brasserie Blanc et al. 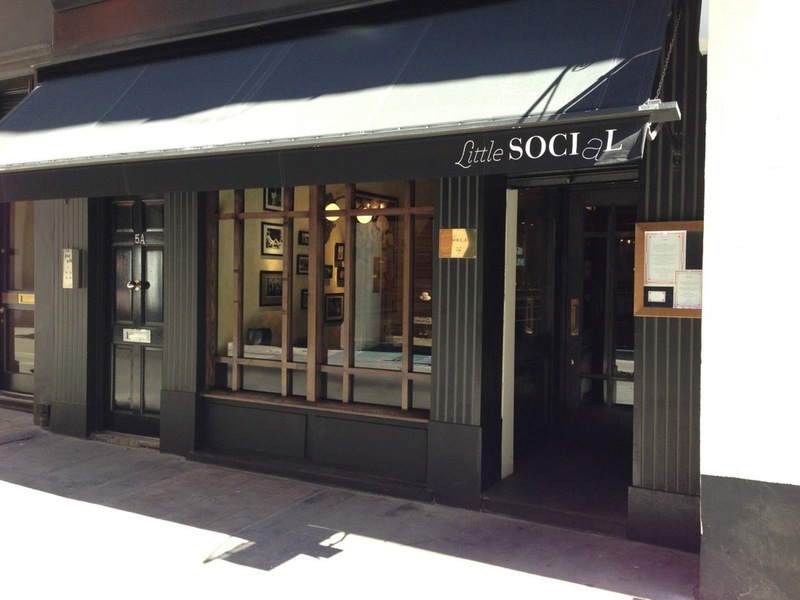 When Little Social was opened a few months ago it received rave reviews – serving high quality food with a modern twist – it’s been on my ‘must visit’ list for a while and I finally managed to get a lunch reservation. Little Social is opposite owner Jason Atherton’s flagship Michelin-starred restaurant – Pollen Street Social. Minutes from Oxford Circus and just off Regent Street it’s about as central as central gets. On arrival I was warmly welcomed by the staff into a wonderful snapshot of Parisian dining: soft art-deco lighting, wood panelling, copper bar and quiet music. Perfect. The set menu (three courses for £25) is great value but I have to admit I went a la carte. While there is a strong French influence (steak frites) there are some decidedly british dishes (ox cheek). Their wine list is excellent with several good choices available by the glass or carafe. I went with the Pollen Street Social House – a delightfully vibrant red from Anjou. The complimentary bread was delicious and still warm. A dish this simple lives or dies by the quality of its ingredients and they didn’t disappoint. The steak was neatly prepared and carefully spiced, the quails egg was a nice touch. The ox cheek was well cooked, with lovely smooth mash, though I didn’t get much heat from the horseradish . 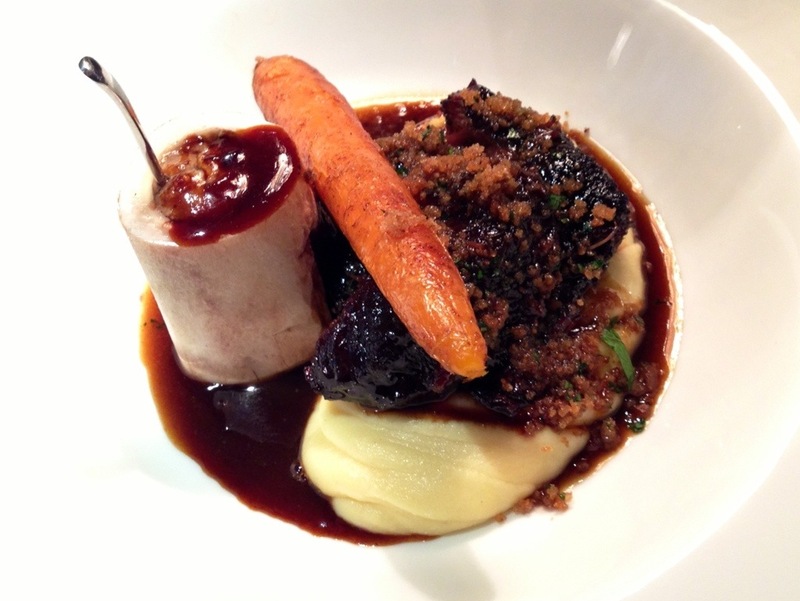 The roasted carrot was cooked well and I really like the bone marrow – it adds another beefy hit. The sourdough crumbs add some textural contrast and really help lift the dish. I ordered this as a side – it’s a slightly incongruous addition given the French slant of the restaurant but decidedly more-ish nonetheless. For the uninitiated, Poutine is a Canadian ‘delicacy’. Really good chips are slathered in cheese curds and gravy. 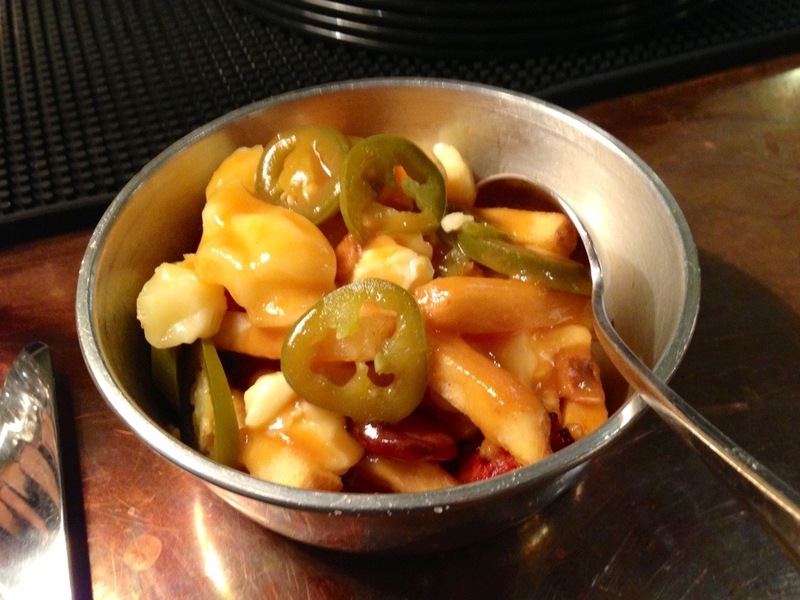 Here they’ve also added sausage and jalapenos. Yum. 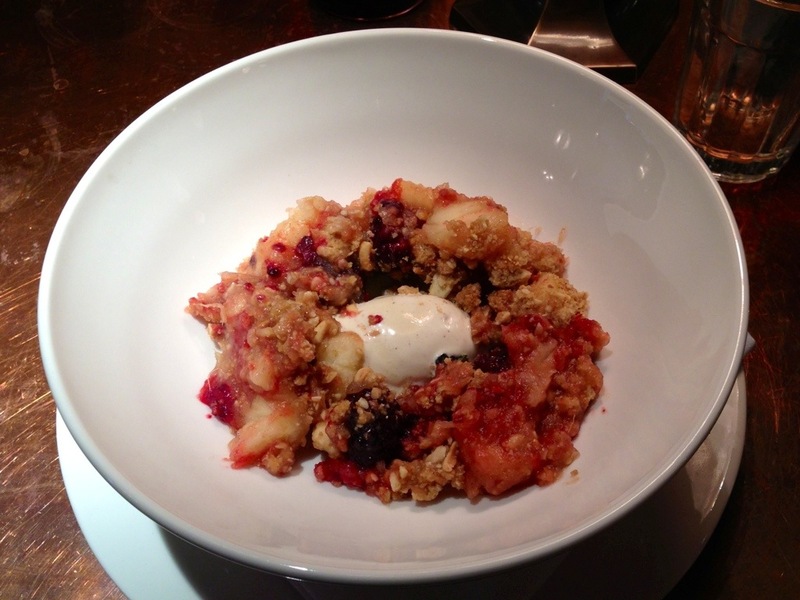 The crumble was served with a degree of ceremony not usually accorded to this humble dessert. A bowl of cinnamon ice cream was placed in front of me before the crumble (in a natty copper pan) was gently stirred and spooned around it. The topping was full of macadamias and walnuts which added a lovely crunch to the proceedings. I’ve heard Little Social mentioned in the same breath as Brasserie Zedel, but that’s really doing it a disservice. While both are harking back to an idea of French dining circa 1920 – Little Social isn’t afraid to branch out and play with the concept and delivers it to a far higher standard (with a higher price tag). The food was surprisingly original and thoughtfully cooked. Other reviewers have commented on the hovering staff, but I never felt overly ‘tended’. It’s a great dining experience and a welcome addition to the west end – I look forward to exploring the rest of their menu in the near future!